I haven’t made any of these cross stitch pendants for a while, but I wore one the other day at the Spring Trunk Show. It reminded me of how cute they are. I love that they are like little blank canvases with endless possibilities. My simple zig zag design was made much cuter by the Valdani variegated pearl cotton thread I used. The pretty scallop of the pendant was designed by Andrew. It looks like a cookie and is by far the most popular design. There have been much more clever designs made on them by Claire, Anabela, Emily, Katherine, Michelle and perhaps more that I don’t know about. Do you have one? I’d love to see it. I’ve been thinking about laser cutting some more of these pendants, with a few new designs. their designs are amazing! i know you started making them a while back, but good idea with these pendants, karyn! this makes me want to take up cross stitching again. I love these, they’re so imaginative. The variegated floss definitely looks extra amazing on them! I’m a more of a petite jewelery fan though, they’re a bit bigger than I’d wear personally, I think. I wonder if they would work as well a little smaller? Or maybe quite a bit larger, hung up like little objet? When I was smaller, my mother always used to cross stitch things. I really should learn how someday soon. the variegated thread definitely makes it way more interesting! i’m excited to see what new designs you will come up with! I love the pendant and I used to cross stitch as well. Do you sell blank ones at your store? My work is very close to your shop. If you do sell them, please let me know, I’d love to check them out! Thanks a bunch! I would love to be able to purchase some of these blank! I think they are adorable! 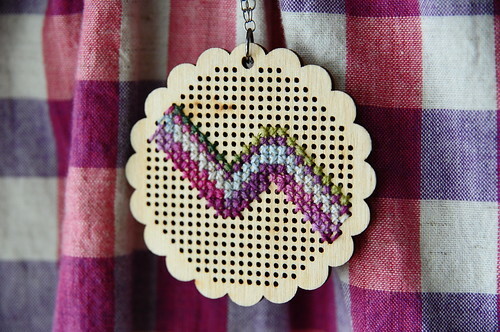 i love the idea of a wooden cookie crosstitch pendant. the scalloped edge is perfect.